This homemade keto granola is a healthy, delicious treat that makes breakfast a pleasure. 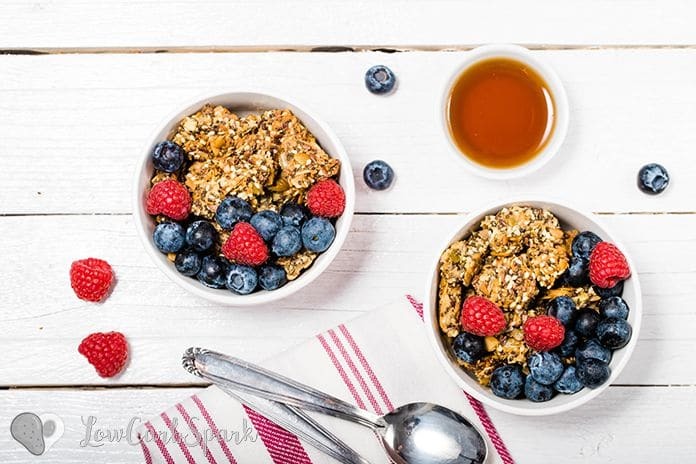 Enjoy granola that is low in sugar, free from unhealthy fats and unnecessary ingredients. It’s super quick and easy to whip up, very filling and you can control the quality of the ingredients while adding your favorite flavors. Aaaand.. Let me tell you about how keto granola makes your house smell fantastic. Besides that, a serving of 1/4 cup (~30g) is only 2g net carbs and has tons of fiber and healthy fats. This is the best granola recipe..ever! 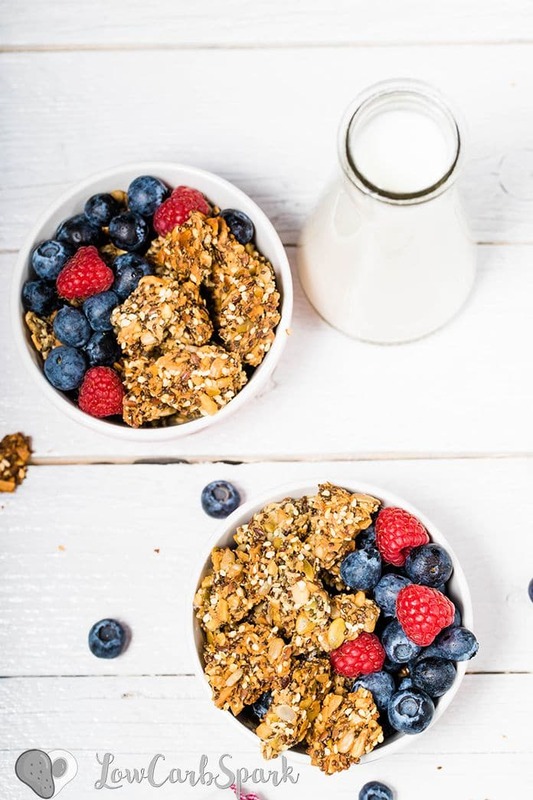 You can have keto granola (oat free) for breakfast with unsweetened plant-based milk with some fresh berries or as a quick snack served on top of low carb yogurt. You can store it in the fridge in a nice jar. Once you make homemade granola, you won’t want to spend your $$$ on extra expensive store-bought granola that tastes like cardboard. This one it’s incredibly crunchy and tasty! Oh and have you tried my Keto Oatmeal aka NoOatmeal recipe, yet? It’s warm, comforting and perfect for a quick breakfast! The base of our keto granola is tons on nuts and seeds that are rich in Omega-3s and other healthy fats. Then we’ll add unrefined coconut oil that helps everything stick together and makes granola crunchy. Nuts & Seeds – We’ll use a delicious combo of almonds, pumpkin seeds, chia seeds, flax seeds, shredded coconut, and sesame seeds. 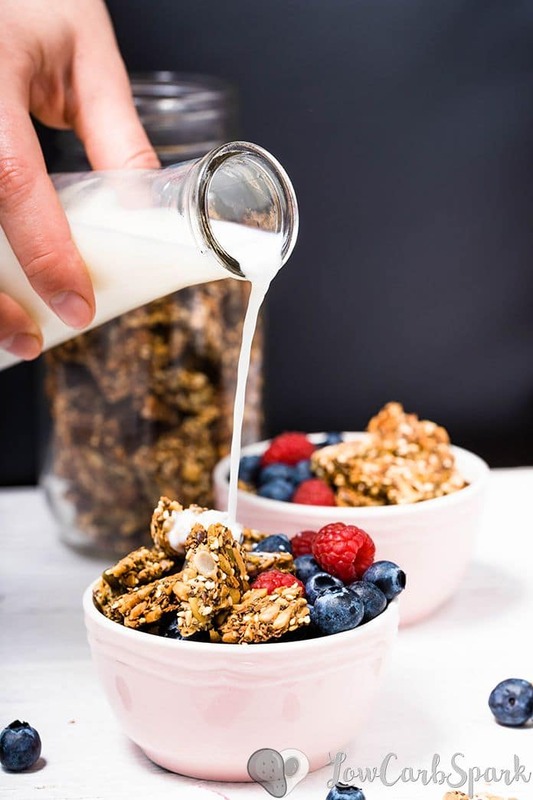 Unrefined Oil – Coconut oil makes the granola crispy and helps everything stick together while giving a subtle coconutty taste. Sweetener – I used an Erythritol based sweetener (such as Swerve), and I noticed it makes granola so crunchy if left overnight. Xylitol (toxic to dogs) is a great way to sweeten this granola too. So, use what you have on hand. Maple & Brown Sugar Liquid Stevia – A few drops go a long way and add that fantastic brown sugar taste. If you can’t find this replace the sweetener with Sukrin Gold – soo good! Cinnamon & Vanilla & Salt – My favorite flavors to add! Not only that cinnamon is delicious but is a powerhouse of antioxidants. You can try other flavor combos such as pumpkin spice, ginger, and lemon. How to make keto granola? Ok, let’s see how to make easy granola! Ready to make some? Using a sharp knife, chop the almonds, pecans and pumpkin seeds. Lightly toast them into a hot non-stick pan for some extra flavor. No more than 5 minutes, while constantly whisking should be enough for the nuts to get lightly brown! In a large bowl add all the nuts, seeds, melted coconut oil, a few drops maple liquid stevia, vanilla, cinnamon and a pinch of salt. Toss everything until its evenly mixed. Evenly spread the mixture out onto a large pan lined with parchment paper. Bake for about 30-35 minutes at 350F /180F. Keep an eye on the keto granola from the minute 20 as nuts and seeds tend to burn faster. Let the granola completely cool. Wait at least 30 minutes (best overnight) before breaking up into your desired size. Add your mix-ins (optional). This is the step where you can add sugar-free chocolate chips, toasted coconut chips or any other spices that cross your mind. So finally, enjoy! Serve it right away and store the leftovers into a sealed jar in the fridge for up to 2 weeks. Make sure you line your baking tray with parchment paper, so your nuts and seeds roast beautifully without sticking to the pan. If you want to get big crunchy clumps, gently press down the granola with the back of a spatula and bake. After it’s fully baked and cooled down break it down into pieces using your hands. Don’t overbake the granola – wait until they are lightly golden and smell incredibly tasty. Spread the granola evenly in the tray so it’ll bake evenly. 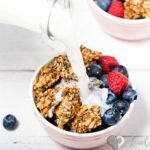 This homemade keto granola is a healthy delicious treat that makes breakfast a pleasure. 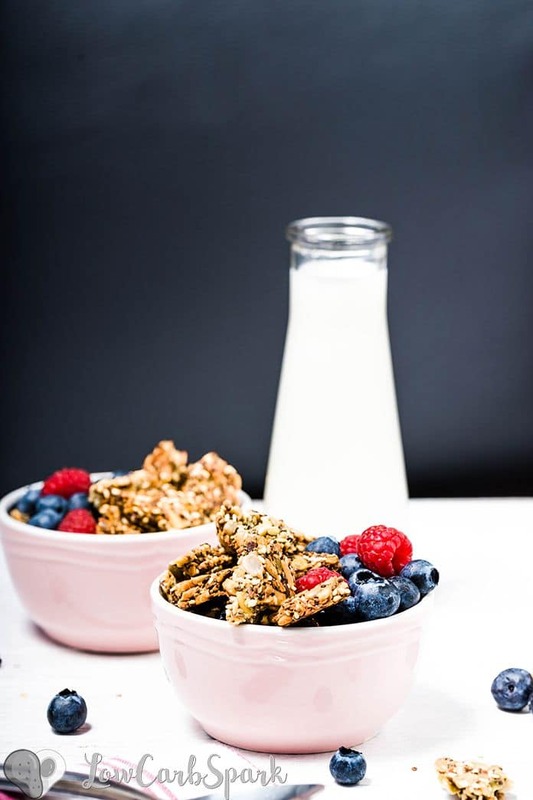 Enjoy granola that is low in sugar, free from unhealthy fats and unnecessary ingredients. It’s super quick and easy to whip up, very filling and you can control the quality of the ingredients while adding your favorite flavors. Chop the almonds, pecans and pumpkin seeds and lightly toast them into a non-stick pan over medium-high heat for some extra flavor. In a large bowl add all the nuts, seeds, melted coconut oil, a few drops maple liquid stevia, erythritol, vanilla extract, cinnamon and a pinch of salt. Toss everything until its evenly mixed. Spread the mixture evenly out onto a large baking sheet lined with parchment paper. Enjoy! Serve it right away and store the leftovers into a sealed jar in the fridge for up to 2 weeks.